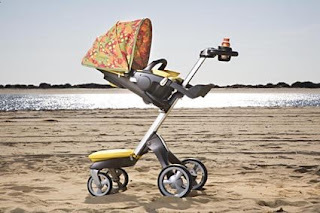 If you aren't the proud owner of simply the best, most stunning stroller in the universe - the Stokke® Xplory® - then you aren't going to be in the slightest bit bothered about this. Any Xplory® owner will know the challenge of pushing the above mentioned dream machine whilst trying to hold a drink - but the Stokke® design team have not sorted this minor inconvenience. the new Cup Holder fits securely into the space within the handle with the use of an adapter. It can carry bottles or cups of all sizes up to 1 litre. Do beware though - as much as we all like a regular Starbucks - the cup holder is not meant to carry hot drinks.